We are experts in developing and producing a wide range of brushed DC electric motors with voltage ratings of 18 - 32 VDC. 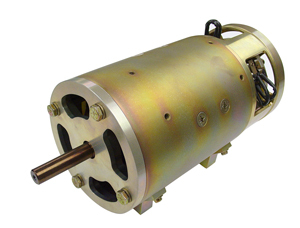 Our motors have output power ranging from 1/10 to 12 HP with speeds up to 30,000 RPM. We are the established industry leader in brush and bearing life, reducing cost of maintenance to our customers. Our motors have permanent magnet or wound field designs and can be customized with many available options including: gear heads, braking systems, and cooling fans. Common applications include: actuators, pumps, compressor drives, hoists, gun feeders, turret drives, engine starters, power drive units, cargo loading, radars, canopy ejection and environmental cooling.